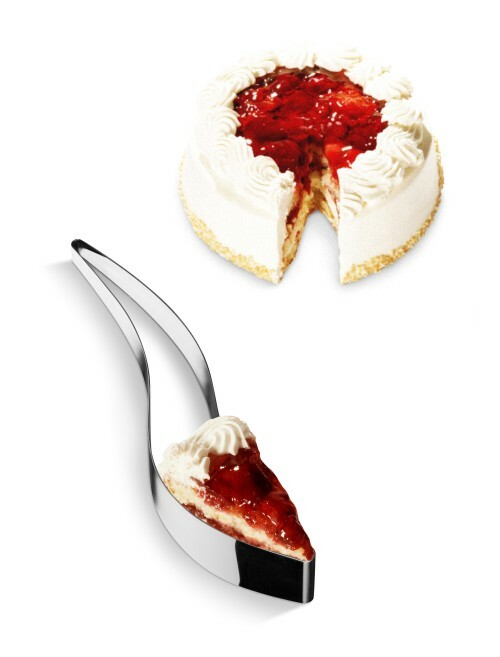 Cutting Cake Gets Easier With The Cake Server | OhGizmo! A simple stainless steel creation by Scandinavian designer Maria Kivijärvi, the Cake Server could replace your current wedge-shaped cake cutter (or even more primitive knife) with this more elegant, purposeful and efficient utensil. It’s both cutter and prongs. Slice, squeeze, carry and release. The only issue we can see is if your horizontally challenged friends demand a larger piece. Or if you’re 20 people sharing slivers of cake. Still, it’s smart and we like it. It’s made by Magisso and costs €60. Keep reading for a video and links.